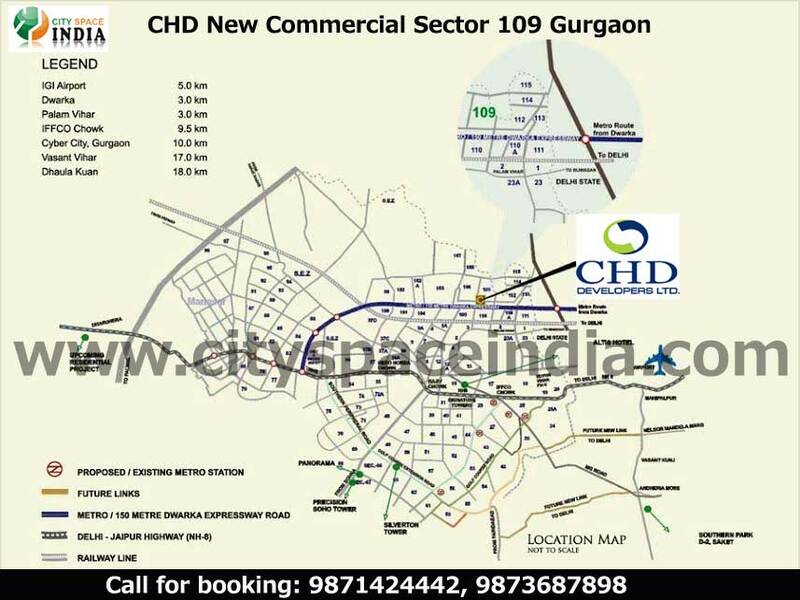 CHD developers coming up with new commercial project in Sector 109 Dwarka Expressway Gurgaon. Project is spread over 2.1 acres of Land, Coming up with Double height retail, with wide atriums, food court and offices. Sector 109, is one of the dense sector of Ex-way as far as Dwarka Ex-way is concerned. Big Residential like Raheja have already given the possession. CHD Commercial is surrounded by more than 1500 acres of residences. Located on 150 mtrs wide on Dwarka Expressway Metro Corridor & close to 60 mts sector road. High Profile Catchment area of Residential Projects like India Bulls Enigma, Shobha Internatinal City,Chintel’s Paradise, Raheja Atharva, Ats Kocoon And Michael Schumacher World Tower Paras Dews, Experion Windchants.Brisk Lumbini Etc. Close to Delhi Border has access to all the amenties of South & South West Delhi as Schools ,Universties Hospitals & Hotels.